SIXTY years ago, people walking in American country lanes noticed the birds had stopped singing. Their concern led to a book, Silent Spring by Rachel Carson, explaining how crop- spraying of DDT killed wildlife and wrecked the local ecology. As well as securing a ban on dangerous pesticides, publicity around Silent Spring brought the environmental movement to public attention. There isn’t one simple reason why children don’t play out any more. The build-up of road traffic, the breakdown of local communities and changes in parents’ working patterns are all implicated, as are the ready availability of indoor sedentary entertainment and a generally more fearful climate (probably related to occasional horrifying media stories about abduction). But the reason we should be concerned about this loss is simple. Active outdoor play is a biological necessity for long- term physical and mental health. As play has declined, we’ve seen more and more cases of childhood obesity, Vitamin D deficiency and other physical conditions with alarming long-term implications for the National Health Service. The reason it’s taken so long to recognise this emergency is that – from an adult perspective – play doesn’t seem anywhere near as important as education. We see it as just kids messing about. And how can what wee ones do when left to their own devices be of any significance? Yet the evidence now emerging from neuroscience and evolutionary biology suggests that play actually has immense significance, not only for health and well- being, but for educational success. In fact, play is children’s inborn learning drive – it’s how evolution has primed them to develop human capacities they’ll need to flourish throughout life. ‘Messing about’, especially in the great outdoors, develops children’s powers of creativity, adaptability and problem-solving. It’s how they hone their social skills of communication and collaboration with their peers, and – through making up rules for their own games and activities – how they come to understand the need for shared rules, regulations and conventions. And it’s also essential for the development of personal qualities like perseverance, self-control and the emotional resilience that we all need for long-term mental health and well-being. These qualities and capacities can’t be taught – either by teachers at school or computers at home – they have to develop in each individual child’s body and brain, in the holistic way decreed by evolution over countless millennia. So does another crucial capacity that develops gradually during the early years: self-regulation. This is the ability to control one’s own emotions and behaviour and it’s essential if children are to benefit from formal schooling. Self-regulation involves – among other things – the gradual development of physical coordination, social knowhow, memory skills, empathy and the ability to make rapid decisions and adapt behaviour to changing circumstances. Play provides endless opportunities for practising self-regulation skills. This isn’t to say, of course, that the adults who care for children don’t have an important role in their physical, social, emotional and cognitive development. Not only are adult carers responsible for keeping the younger generation safe and providing for their material needs, but from the moment children are born they act as models for social behaviour, pass on communication skills and supervise the environment in which play happens. Perhaps most important of all, they also provide the unconditional loving support that underpins a child’s sense of personal confidence, self-worth and self-respect. But an important part of that loving support is knowing when to back off. If adults over-supervise and over-direct children’s play, there’s a serious danger that their charges will fail to develop a sense of personal agency and self-efficacy, qualities that are just as essential for long-term self-regulation skills and emotional resilience as confidence, self-worth and self-respect. Play provides opportunities for every growing child to discover his or her own strengths, to experiment with small manageable risks, to learn through trial and error how to cope with setbacks, to rise to challenges and bounce back from difficulties. The need for adults to ‘back off ’ during play can be accounted for in terms of our species’ cultural evolution. For most of human history contraception didn’t exist so, by the age of two or three, the overwhelming majority of children would be supplanted in their mother’s attention by a new baby. The ‘old baby’ (now independent enough to cope) would become the responsibility of big brothers, sisters, cousins and so on, as they played out in the local community. Adults would still keep a weather eye on proceedings, but in every time and culture until the twentieth century, the overwhelming majority of young children had a great deal of freedom to play and, as they grew older, a fair degree of responsibility for ensuring the well-being of their peers. The implications of this for social and emotional development are clear. Personal social skills and a personal sense of social responsibility have, to a large extent, been acquired by children through the centuries as a result of personal experience. While adults can help the process along by modelling self-regulated behaviour and, hopefully, advising and supporting children in dealing with squabbles and fall-outs, the children also need time and space to internalise these skills through their own efforts. If grown-ups always rush in and sort out social problems that arise during play, we deprive the next generation of opportunities to develop the sense of personal agency and self-efficacy that underpins self-regulation, emotional resilience and intrinsic motivation to learn. Learning through play is particularly important in the first seven or so years, when children are establishing the neural networks that influence the whole of their lives. Throughout human history, the under-sevens have been regarded as ‘infants’, for whom play is the main activity. The Romans divided childhood into three seven-year chunks: infans (birth to seven), pueri (seven to 14), adolescens (14-21) and when formal schooling first became normalised (at least for wealthy, male children) by the Greeks and Romans, it began at age seven. In 1837, when the educationist Frederick Froebel set up his Institute of Play and Activity for Small Children (the world’s first ‘kindergarten’), he too chose seven as the age at which children were ready for formal education, as did other great early years pioneers who followed him – such as Steiner, Montessori and Malaguzzi – and the two great twentieth century developmental psychologists, Piaget and Vygotsky. Nowadays, the United Nations errs on the side of caution, defining ‘early childhood’ as the period from birth to eight years old – ‘a time of remarkable growth with brain development at its peak. . . [when] children are highly influenced by the environment and the people that surround them.’ High quality early childhood education and care (ECEC) is therefore based on well-established developmental principles, in which nurture and learning through play are prioritised, rather than a narrow focus on ‘academic’ skills. In most European countries, there is a kindergarten stage before formal schooling begins, for children from the age of three to six or seven. 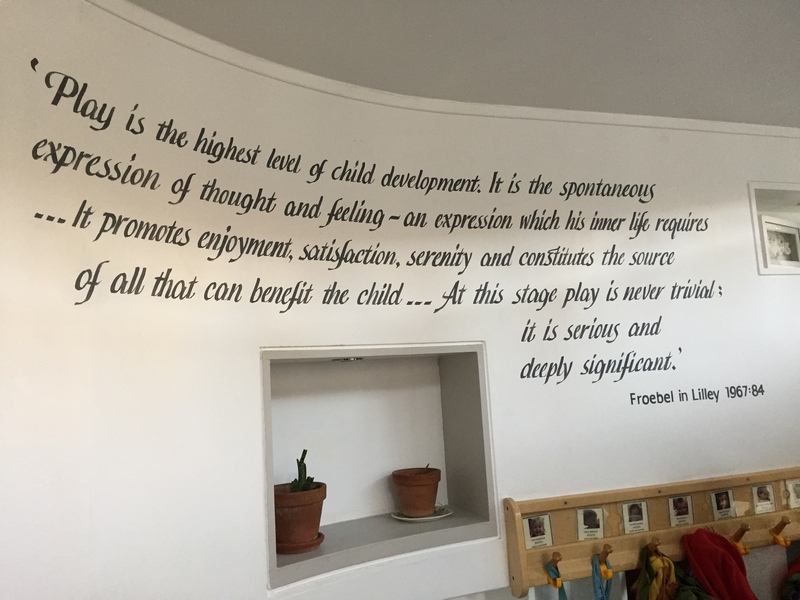 Friedrich Froebel’s vision on the wall at Cowgate Nursery, Edinburgh. Scotland is one of only four countries in Europe that sends its children to school at the age of four or five: the others are England, Wales and Northern Ireland. Indeed, only 12 per cent of countries worldwide start school so early. . . and all bar one are ex-members of the British empire. Our early school starting age was decided by the Westminster parliament in the late 1860s. 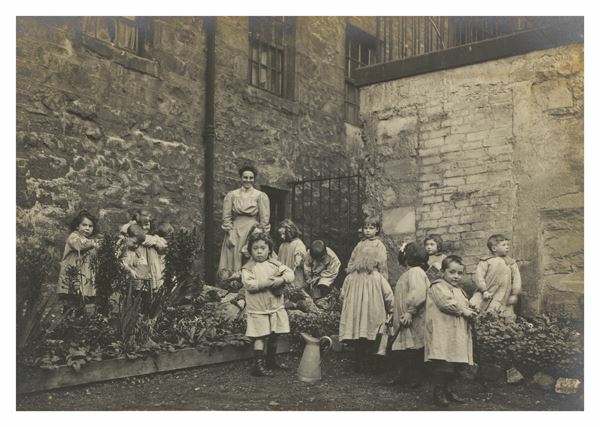 It was deemed convenient to begin compulsory schooling as early as possible because it released mothers from childcare to work in the factories – and the sooner children began their education, the sooner they could finish and go to work in the factories too. Even at the time, four or five was considered by many parliamentarians to be too young for school. But the economic argument swung the vote and compulsory schooling, starting the year children turn five, has been the norm in Britain and much of the Commonwealth ever since. After 150 years, we take it for granted that children should start school – where we automatically assume they will get cracking on the three Rs – at the age of four or five. Yet, as outlined above, there’s never been any educational justification for this very early school starting age and a number of international research studies have shown that beginning formal education before the age of six is not only educationally unnecessary but can, in some cases, have long-term negative consequences. Nevertheless, there hasn’t been widespread concern about the UK’s early start policy until very recently. Perhaps one reason is that, until the turn of the last century, most children still had plenty of freedom to play: every evening, at weekends and during school holidays, four-, five- and six-year-olds would be out with their pals in the local streets, fields or wild places, making up for all that wasted time in the classroom. However, as that freedom has disappeared, it’s increasingly apparent that – despite immense investment of money, time and professional expertise – the performance of early-start countries in inter- national comparisons of achievement in literacy and numeracy has been distinctly lacklustre. There has also been a serious increase in developmental conditions and mental health problems. It shouldn’t, in fact, be the case in Scotland, where our Curriculum for Excellence includes an ‘Early Level’ (starting at three years old when children are in nursery and extending to the end of Primary 1) which is in principle play-based, as in mainland European countries. Sadly, its principles have not yet been translated into practice in the majority of P1 classes – or indeed in some nurseries. Our deeply embedded cultural expectation that four- and five-year-olds should be learning the three Rs is partly to blame – we’ve simply carried on doing what we always do. But these expectations have been exacerbated by media reports about educational policy in England and the USA where, over the last couple of decades, tests-and-targets educational regimes have led to a steady ‘schoolification’ of early years education. And it certainly hasn’t helped that Scotland’s ‘Early Level’ is split right down the middle: the first half takes place in nurseries (and is generally regarded merely as ‘childcare’) and the second in primary schools, so there is no feeling of coherence about the Early Level as a whole. Then in autumn 2015, the First Minister – under pressure about Scotland’s poverty-related attainment gap – announced the introduction of national assessment in literacy and numeracy, starting at Primary 1. Detailed targets for the age group were drawn up (known in Scotland as ‘benchmarks’) and the national standardised testing regime was introduced in the 2017-18 school year. Ironically, as these political moves were going on, there was finally an upsurge of interest in turning the play-based principles of Early Level into practice in Primary 1 classes. It remains to be seen whether P1 teachers’ enthusiasm for this project can weather the effects of the incoming national tests-and-targets regime. But in every other country where such a regime has taken hold, it has caused a narrowing of the curriculum, encouraged teachers to ‘teach to the test’ and steadily increased levels of anxiety about achievement among teachers, parents and pupils. In these circumstances, learning through play is seldom prioritised over the teaching of literacy and numeracy skills in preparation for national tests, and it becomes increasingly difficult to provide a nurturing, relationship-centred ‘kindergarten ethos’. The Scottish Government’s decision to introduce national tests was based on the best of intentions. They were alarmed at the growing gap in educational attainment between children from low- and high-income families. So they naturally assumed that the best course of action was to focus attention on improving the three Rs, beginning – as seemed sensible to them – as soon as children start school. In making that assumption, however, they’ve inadvertently bolstered deeply-entrenched cultural attitudes about the care of young children, which are not consistent with current knowledge of child development. They are, however, consistent with the robust Victorian values that led to our early school starting age in the first place. At a time when most adults believed ‘children should be seen but not heard’, it made absolute sense that infants should be herded into school the year they turned five and productively engaged in learning the three Rs. To hard-headed politicians in the 1860s, the joyful sound of children running, jumping, making dens and playing ‘let’s pretend’ didn’t seem remotely productive. 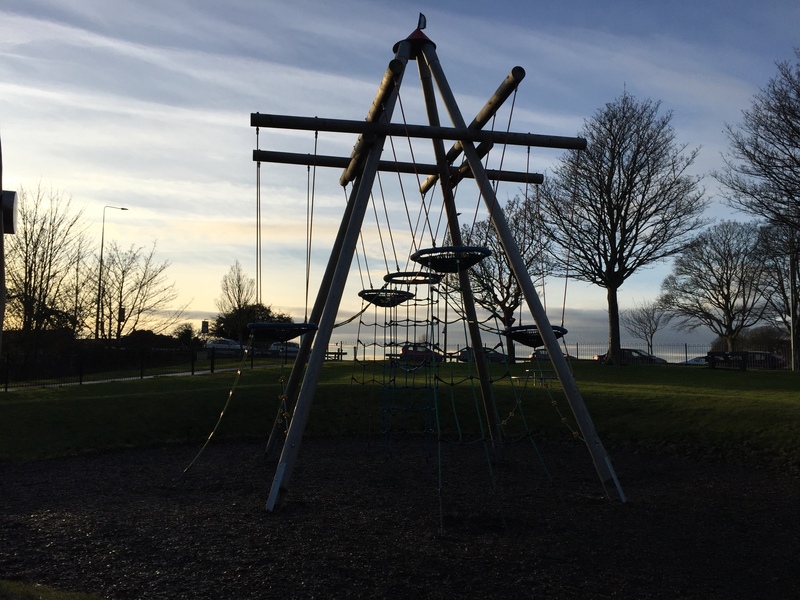 But we now know that – if we are to avoid long-term, on-going costs in health, additional educational needs and social welfare provision – the sound of children at play is very important indeed. We also know that the under-sevens learn best through play, and their teachers support them best through forging positive, nurturing relationships. By introducing a relationship-centred, play-based kindergarten stage, Scotland could ensure that all our children have the time, space and support to build firm foundations for formal education, while at the same time enhancing their potential for lifelong health and well-being. By ensuring that – as in the Nordic countries – a large proportion of every day’s play takes place outdoors, we can return the sound of children playing to the heart of every community. And by maximising the use of local parks and green spaces, we can give the next generation the opportunity to learn and grow in the natural environment that’s nourished the young of our species throughout history. Our culture may be evolving at the speed of light these days, but biological evolution is a long, slow process. Young human beings still need what they have always needed for healthy development. 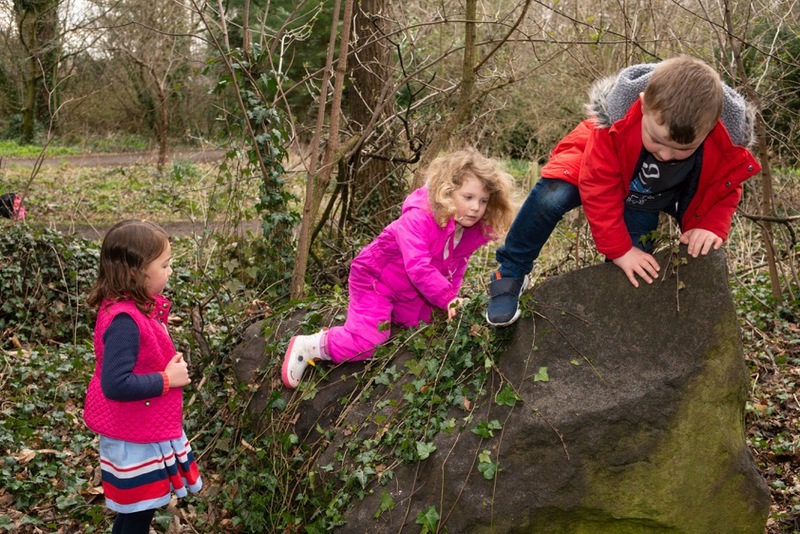 In a culture that’s increasingly urbanised, sedentary and screen-focused, we need a radical overhaul of universal care/education provision for the under-sevens to ensure they have frequent and regular opportunities to play, as often as possible outdoors and in nature. We may not be able to bring the joyful sound of children playing back to all of Scotland’s streets but by introducing a ring-fenced kindergarten stage we can ensure that our youngest citizens have the best possible chance of flourishing. Her most recent book is Upstart: the case for raising the school starting age and providing what the under-sevens really need (Floris, 2016). Thank you for this timely article which asks important questions about our conception of childhood and the kind of early experiences that foster healthy physical, emotional and intellectual development. There are tensions between the rhetoric of official educational policy (wellbeing, nurture, etc) and the emphasis on early assessment and narrowly defined ‘attainment’. Some of the principles you are recommending were advanced more than a century ago by Margaret McMillan (1860-1931), an early advocate of open-air nurseries. Although educated in Scotland, her ideas were resisted here and most of her work was carried out in England (in Bradford and London). I’m afraid it is a recurring theme in the history of Scottish education. The bureaucratic mind is more interested in uniformity than creativity. Look at the way other progressive thinkers have been marginalised – A. S. Neill, John Aitkenhead, R. F. Mackenzie. Neill, for example, was awarded three honorary degrees by English universities but none in Scotland (despite being a graduate of Edinburgh). Nevertheless, it is very encouraging that outdoor learning is now being taken seriously and actively promoted by organisations such as Upstart Scotland. Good luck with your campaign. Society must wake up and realise what is so very wrong with this indoor foundation for young children.